Music. Art. Music. Art. Music. Art. The recreational waves of Erie summers are rolling in without calm water in sight. Hold on to your swimming trunks, as this weekend will be no exception since another surge is headed straight for the peninsula. 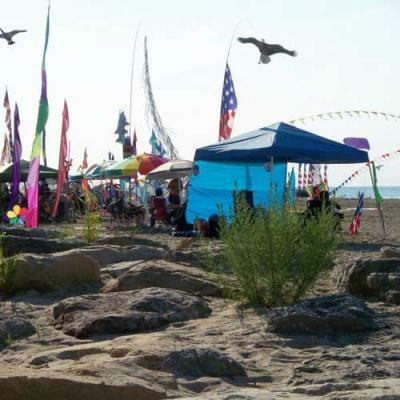 Discover Presque Isle hits the shore July 26, 27, and 28, bringing with it a cascade of colorful art, summery music, and support for our state park. It's safe to say most Erieites have taken a drive around the peninsula, taken a dip in the lake, or devoured a couple of hot dogs at Sara's, but there is so much more to be discovered. "It's a three-day event that shows all the various ways that you can enjoy Presque Isle," says Steve McDermott, executive director of Presque Isle Partnership. Over the years Steve has helped add to the list of ways locals and tourists can enjoy this waterfront park, with these lakeside events including classics like kayaking and pontoon boat rides which he calls "Presque Isle's best kept secret." "If you go on a pontoon boat tour or kayak in the Lagoons, in ten minutes you'll feel like you're not even at Presque Isle and you're at a completely different park," Steve adds. When admiring the park from the placid waters of the lagoons, the view looks foreign; you could be looking at the lush greenery of a Louisiana swamp or be gazing at the flat waters of a Florida marsh, teeming with life – substitute the alligators for common map turtles – but what you're really looking at one of the many hidden facets our city's state park has to offer. If you're not up to getting wet but still feel like working up a sweat, this year's first Three Mile Isle lets runners navigate through some unexplored grounds between Beach 10 and 11, the 4th Annual Presque Isle Beach Brawl tests the strength of wrestlers and non-wrestler's alike, and you can catch some sunrays during the volleyball tournament. But Discover Presque Isle is also about kicking back and enjoying the sights and sounds. Beach 8 is hosting the Sand Sculpting competition, live music from singer/songwriter Matt Thomson, Fire and Ice, local favorite The Sam Hyman Band, and Pittsburgh alt-rocker's JD Eicher & the Goodnights, and to set the mood, a big ol' bonfire will be lit Saturday around 8:45 p.m.
"It's the only time out of 365 days of the year that you're going to see a bonfire that big at Presque Isle," Steve says. Along with providing a plethora of activities, all of Discover Presque Isle's proceeds get funneled back into the park to keep the peninsula shipshape while also being able to add new attractions. Judging by past years – when the weather is right – the whole weekend event can take in about $90,000. In 2005, this money helped build the one-of-kind playground in the Waterworks area. "You won't find another playground like that around here anywhere," Steve says with confidence. However, this unique design is not only a great place for kids to play, but it also serves a purpose. "We chose that [playground] because it requires kids to really have to work hard to play there. The whole point of it was to fight childhood obesity." Shipped from Germany, the playground is built like a barge, made to take a beating from Erie's harsh winters and a lot of hard playing children. Beyond the playground, proceeds were also used to build the new Turtle Observation Deck in the lagoons. The viewing stations don't cost a penny but the sights are worth every one of them. The newest blueprint on the drawing board is a creative play place for children, that Steve says will "connect young kids with nature," and at the same time, "be very educational, fun, and challenge kids' creativity." This year, the fundraising buttons will sport a new design – a little frog donning 18th century garb to commemorate the Perry 200. There is also a mystery button, one that could earn you a cool $1,000 if it has the winner number. The peninsula is one of Erie's most valuable assets and events like this remind us of this precious location. Discover Presque Isle adds more to the map each year, and its funds help make this city's very own State Park a place to be proud of.